Turn your garden into an Eastern paradise throughout spring and summer each year! Magical deep, wine-red foliage will provide a wonderful contrast with the green of your grass. Will grow to approx. 4m (13ft) in 10 years. Fully winter Hardy. 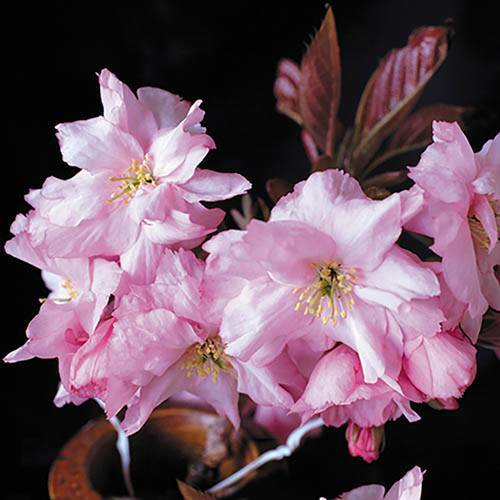 This wonderful ornamental flowering cherry tree will turn your garden into an Eastern paradise throughout spring and summer each year! Royal Burgundys name comes from its deep, wine-red foliage that looks simply magical and will provide a wonderful contrast with the shades of green of your grass and other shrubs and trees. It is followed in spring by a truly spectacular show of soft-pink, double flowers, literally smothering every single branch. This beauty is fully winter hardy and will come back every year, giving you decades of joy, every time you look into your garden. Supplied as approx 1.2M tall Will grow to approx. 4m (13ft) in 10 years. Fully winter Hardy.